The Department of Public Works installed bike detection cameras and accompanying signs at seven intersections today. The devices will detect riders as they arrive at traffic lights and signal the need for a green light. The sensors should keep bikers from having to shimmy to the sidewalk to press the crosswalk button, or rely on cars to trip the signal. Both convenience and safety were behind the installations, said DPW bike planner Rachael Bronson. 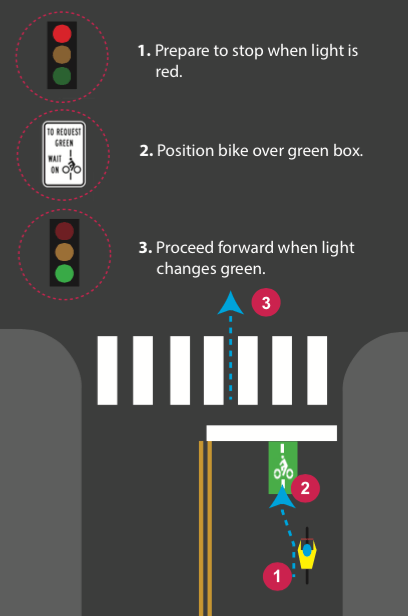 The cameras will detect a bike anywhere in the street — they can distinguish between bikes and cars by the differences in size and pixels — but in general workers painted green markers in the center of the lane, just behind the crosswalks. West 35th Ave. and Federal Blvd. West 17th Ave. and Federal Blvd. Colorado Blvd. and Montview St.
York St. and East 23rd Ave.
Evans Ave. and Oneida St.
East 1St Ave. and Gilpin St.
Funding came from a federal grant distributed by the Denver Regional Council of Governments, so they had to be placed on regional routes, Bronson said. The city will study the effectiveness this year and aim to install more in 2016, according to DPW. I’m very excited about this, and hope it works well enough for wider installation! The sensor at 17th and City Park Esplanade northbound didn’t work last night. Waited through two cycles of the light, ’til a car pulled up beside me.